Swim4Good swimmer Mark Drendel writes about his May 23rd swim and Em provides some color commentary. During the weeks leading up to the swim I felt good. 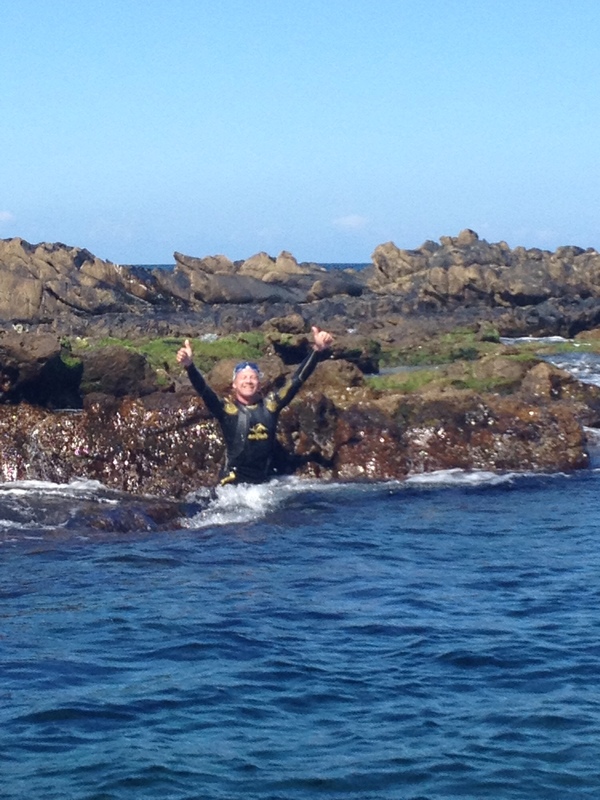 Had reached my 100km goal in April, mostly swum in the sea. Was healthy, confident. Prepared enough, I thought. “Are you nervous?” People asked me the weeks before the swim. So many people were asking whether I was nervous, I was starting to get nervous. I really wanted to be able to complete the big swim and reach the Moroccan coastline, but I didn’t feel nervous because I trained hard and decided that I would simply do the best I could. Hopefully it would be enough. Our arrival to Tarifa was eerily similar to our first days in Tarifa last year when Swim4Good crossed and I was on their crew. Bright sunshine and fierce 50km/hour “Levante” winds from the east greeted us. We stayed in the same small hotel, and they gave me the same room! We even made the same mistake on the way from Sevilla and drove into the city of Cadiz and accidentally stopped at the same gas station. Déjà vu. I took it all as a good omen. When we met with Rafa the director in charge of the crossings, he confirmed that the first days in my weeklong window were not going to be favorable for a crossing unfortunately. The dangerous winds were expected to last for 5 days, but once these easterly winds died down, the new westerly “Poniente” winds would also be too strong and bring rain. In addition, the tides that dictated the departure times did not coincide with the times of the day when there was less wind. We would probably have to wait until the end of the week he said. Hmmm. I was lucky to have had some friends stop through and keep me company in Andalucía and catch up with other friends to distract me. We loved Tarifa, but the wind was driving us loco! We escaped and danced in the feria de Jerez, carb-loaded in Gibraltar with a traditional Sunday roast, and took in the sights in downtown Cadiz, Malaga and Marbella. In the meantime we obsessively cross-referenced all of the wind apps and learned enough about tides to write a dissertation. “Obsessively cross-reference all wind apps” is really to say the least. I knew at what time each wind app was updated and had an alarm on my phone when I could check the latest forecast. Then I found another website that showed the weather around the Northern Catalan ports which is where the Tramontana wind begins. The Tramontana as I understand it, is responsible for the Levante. So I started tracking weather patterns that could influence the weather patterns of the Strait. In the meantime, I started making batch after batch of chocolate chip cookies to bring for Mark’s swim. Forget the gels and energy drinks, he needed good old fashioned carbohydrate intense-sugar-loaded American Chocolate Chip cookies. I made no plans for the whole week. I was on edge waiting in Barcelona, as I would have to organize my household, which resembles more of a three-ring circus than a family of five. There was a black cat that showed up in Tarifa at the end of the week to test my mettle. I am not a superstitious person, but when you are about to swim the Strait of Gibraltar and you see a black cat cross your path, you don’t take any chances, right? So we spent the last days in Tarifa having to take roundabout detours to avoid tempting fate. “Winds in the east, mist coming in. Like somethin’ is brewin’ and bout to begin. Can’t put me finger on what lies in store, But I fear what’s to happen all happened before.” Bert signing. Of course no one got this reference because I am the only mom in Mark’s crew, and part of being a mom is watching great classic children’s movies as if you were back in university studying classic literature. Swim4Good was on the way! Em & Mau came down from Barcelona late Wednesday night, with homemade chocolate-chip cookies and new Gibraltar 2014 music mix in tow. On Thursday morning we woke to light rain. When we arrived to the port, the first thing out of the captain’s mouth was, “How about Friday?” There was lightening and thunder. He couldn’t take the risk. Of course we were disappointed, especially since we’ve been waiting all week and Em & Mau didn’t have time to wait around. It turns out that it was a quick storm that hit just during this short window of time we had available to depart. So we postponed the swim again until Friday morning, the last possible day of my week, and fortunately Em & Mau agreed to stay on one more day. Now I was really getting nervous! We were able to depart on Friday morning and had fantastic conditions. Mau and I were in the lead white boat. I think the best part of swimming is not swimming. Antonio (heavy Spanish accent): We are escorting a swimmer across the Strait, could you deviate from the shipping lane in order to avoid us? Container ship captain (heavy Chinese accent): Are you a tow boat? Antonio: No, we can not move any faster, could you diverge towards Tarifa? Container ship captain: No, we are too big. Are you a white boat? At this point I started translating for Antonio because he could not understand the accent of the container ship captain. The conversation went on but also went nowhere. Finally, Antonio gave up and said that we would just stop and wait for the ship to pass. Fortunately, a few minutes later Fernando, the captain of Mark’s support boat picked up the conversation and was able to communicate something to the Container Ship Captain and we saw the ship shifting towards Tarifa. Was fortunate to see the African coastline clearly from the beginning, which helped me focus. In the water, however, I was oblivious to everything that was going on around us. I was very lucky to have had ideal conditions: a light wind, calm sea, and a current in my favor (in the beginning). Every time I took a breath I had the Zodiac in my sight, and I looked out ahead for the white boat ahead every once in a while. Mark is one of the most selfless and positive people I know. I believe that his karma came back to him this day because the conditions were better than ideal. Mau was inching to jump in so somewhere after the container ship moment, Mau jumped in to keep Mark company. At that time we started spotting wildlife: we saw hundreds of dolphins, pilot whales and one sperm whale. The pilot whales swam under the boat and you could hear they sonar ringing as they approached. It was magical. I couldn’t see the whales and dolphins but occasionally I could hear their high-pitched squeals in the water while I swam which was amazing. I didn’t know Mauricio had jumped in the water to join me until I saw a pair of legs ahead of me, and it shocked me at first. I thought we were crossing another swimmer? He joined me for an hour or so in the middle of the Strait. I followed the familiar feet and appreciated the company. He gave me energy to push on. Mau was ahead and could actually see the animals. While he was in mid-stroke he informed the Zodiac. “Dolphins” he was casually telling them while he was swimming and pivoting his head to breathe. Head down, head turned, take breath “Dolphins” he said, head down, head turned, take breath “Dolphins. When they had told me during the swim that there were dolphins and whales around me, I thought: should I be scared of them? Like Flipper for instance: wasn’t he mean in real life, like a movie star behind the scenes? Dolphins are smart, but they could still hurt humans. And then I remembered the story of Jonah being swallowed by the whale (scared), but that it couldn’t really happen because the whale´s throat could not swallow a human being (not scared), but that whales DO have teeth (scared), but the ones in the Strait only eat krill (not scared). Keep calm and carry on swimming. Once it was time to stop for a feeding, but they said if we stop here we would get run over by a different freighter coming quickly, so we had to continue on quickly for 10 minutes more. I followed orders. Em: The second half of the swim was not unlike the first half, except for the change in currents. 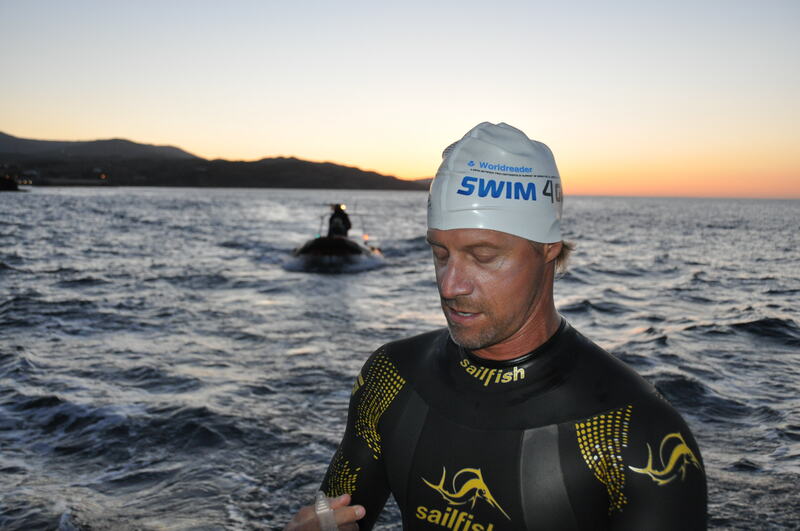 Mark benefitted from a strong tidal current for most of the swim but couldn’t avoid the African coastal current where 2kilometers feels like 5. From the deck he looked strong and kept his stroke long but the captain kept telling me that he had to pick it up to get through. I gave him a pep talk, cheered and screamed at him until he crossed it and found himself navigating through the fishing lines of some coastal fishermen hundreds of meters from the coast. My shoulders were so sore – could I get through the current just by kicking harder? The Zodiac was always at my left side, but now the crew was directing me to swim towards the right AWAY from the boat, against the current. Their arms were always aggressively pointed away, like “don’t dare come near us.” And the swim was frustrating; despite giving it my all I wasn´t moving anywhere and was not getting any closer. I really wanted one of Em’s cookies. But after a long hour of battle we got through, and I was able to reach the coast, successfully avoid getting tangled in the fishermen’s lines, and climb the rocks at Cires Point. 17,7 kilometers. 4 hours and 27 minutes. Thank you to Swim4Good for being the inspiration behind my swim and for taking time out of your busy lives to accompany me that week to help me cross. Thank you for the friends who stayed and who stopped through Tarifa that week to keep me company. And thank you to friends and family who supported me from afar! I have now happily deleted all of the wind apps from my phone.